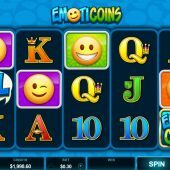 Emoticoins slot is Microgaming's effort at the smiley icon theme, covered first by Endorphina's vastly superior Slotomoji game and later by Netent with their interesting Emoji Planet. Now if I recall correctly I first saw Emoticons about 20 years ago and as the human race has started to forget what it's like to speak in person to each other instead of via devices, unfortunately these annoying and inane characters have become endemic. Here we get a rather dull and uninspiring dark blue reel set on a light blue background with an irksome soundtrack of artificial music along with the predictably daft sounds and animations when a win appears. Will we leave this slot with a sad or a smiley face though? 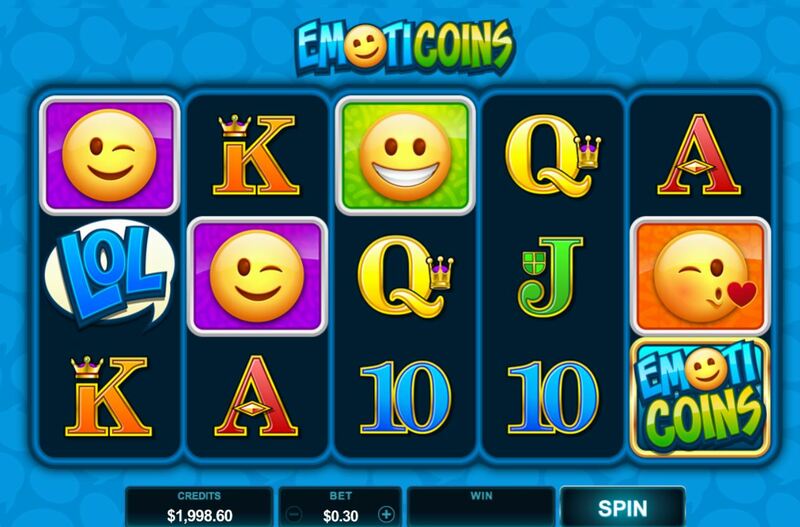 Emoticoins has 30 pay lines over 5 reels of 3 rows each and pay 30 coins per spin. Symbols are single and we do get an Emoticoins Logo Wild on all reels of which 5-of-a-kind will pay 50x bet, although 5 Scatters pays 100x. We then go down through the pays predictably with various Emoticons, Cool at 28x, Kiss at 25x, Smile 22x, Tongue at 17x and Winker at 13x. Card values form the five remaining ones at 3 down to 1x bet for a full line. In-play we may get a random 'Wild Blast' whereby 1 to 5 Wilds are fired onto the grid while the reels spin, possibly creating wins if they don't do their usual stunt of landing uselessly on the end reels. Yes, we couldn't get through this without the derided 'LOL' being involved somewhere. Some say 'Lots of love' and others 'Laughing out loud' but here it means free games if it appears 3 or more times anywhere in view. You get 10 free spins and starting with the first spin and then on alternate spins i.e. 3, 5 and so-on you get a randomly-placed sticky Wild and naturally to prevent any sizeable wins there is no retrigger possible.